Here are the details of your Valentine Wife Wife card, Remember we can post it directly to you or your chosen recipient with your own personalised message. The price includes free UK delivery. 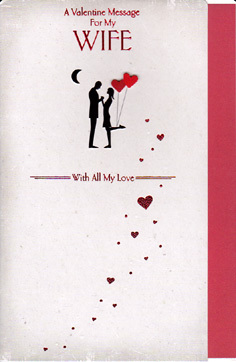 A very beautiful striking Valentine card for a special Wife. Embossed with deep gorgeous red metallic detailing on wording and design with two small red 3D effect hearts on design.